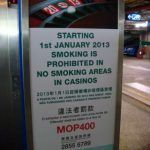 The Macau government is easing its position on smoking inside casinos, and that’s much-welcomed news to resort operators who are desperately trying to stabilize revenues. 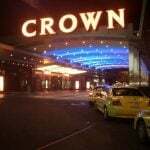 The health bureau’s revision is a win for casinos, as patrons would have otherwise been forced to routinely exit the resort to smoke a cigarette or cigar. However, the agency is also suggesting to the legislature that while lounges should be permitted, special smoking exemptions for VIP rooms and tables should be annulled. The city’s health bureau has been pushing a citywide indoor smoking ban dating back to July 2015. 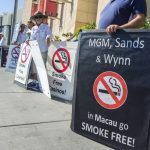 The effort was in response to the Macau Legislative Assembly passing a bill now seven years ago that set a goal of making the region a tobacco and smoke-free territory. In 2013, smoking inside casinos became restricted to designated lounges. The office makes suggestions to the government’s legislative arm, and it hopes the chamber will introduce and pass a bill based on its latest recommendations this summer. 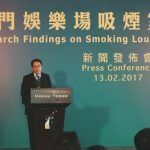 Macau’s Health Director Cheang Seng said the reason for his department’s policy change was in part due to a recent survey conducted by the University of Macau that found 55 percent of employees support retaining smoking lounges. “We cannot ignore this fact,” Seng explained. Lounges inside Macau casinos currently resemble those commonly found inside airports in the US. Most are completely enclosed structures, but doors often remain open for periods of time that allow smoke to permeate into the general gaming space. 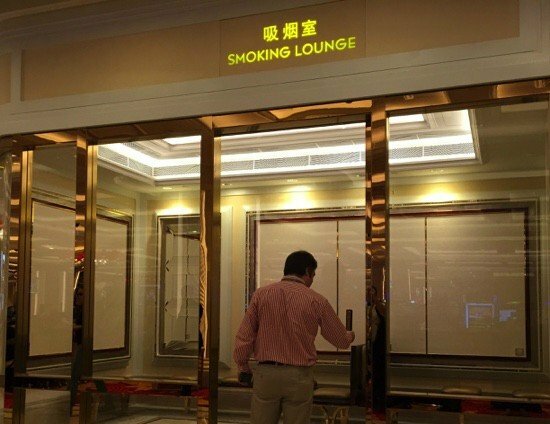 Though the health agency is advocating for the continuation of smoking lounges, its recommendation comes with more stringent oversight and improved facilities to keep smoke from lingering to the floor. A smoking lounge will be in violation of the law if its door remains open for a continuous period of 60 seconds or more. Tobacco-related advertisements will also be barred, while information explaining the dangers of smoking must be clearly displayed. Macau’s gambling goldmine mecca is home to the biggest names in the casino business. MGM, Las Vegas Sands, and Wynn Resorts are all heavily invested in the region, and all are of course concerned with the region’s gaming revenues that have plummeted since 2013. China’s crackdown on VIP players being shipped in via junket tours has led to fewer bets being placed in the exclusive high-roller rooms. The city has experienced a rebound of sorts recently, as the resorts have moved from focusing on the wealthy traveler to a more family friendly approach. Various attractions are now appealing to a wider demographic, and it appears to be working. Macau was booked solid for the Chinese New Year holiday earlier this month, as mainlanders descended on the city to see the Parisian’s new half-size replica of the Eiffel Tower and take a ride on Wynn Palace’s SkyCab. While smoking might not seem part of the “family friendly” plan, the fact is that cigarettes remain highly prevalent in China. According to data provided by The World Bank, one in two adult males is a regular smoker there.